The discus fish is native to the Amazon river basin. These fish are known for their distinctive shape, bright colors, and unique patterns. 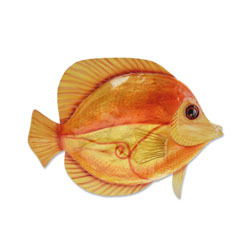 The artist who painted this fish paid attention to the interacting color patterns. Using capiz shell, he emulated the natural scales of this fish.